Hundreds attended the ribbon cutting ceremony in front of the Patrick G. and Shirley W. Ryan Center for the Musical Arts on Thursday. 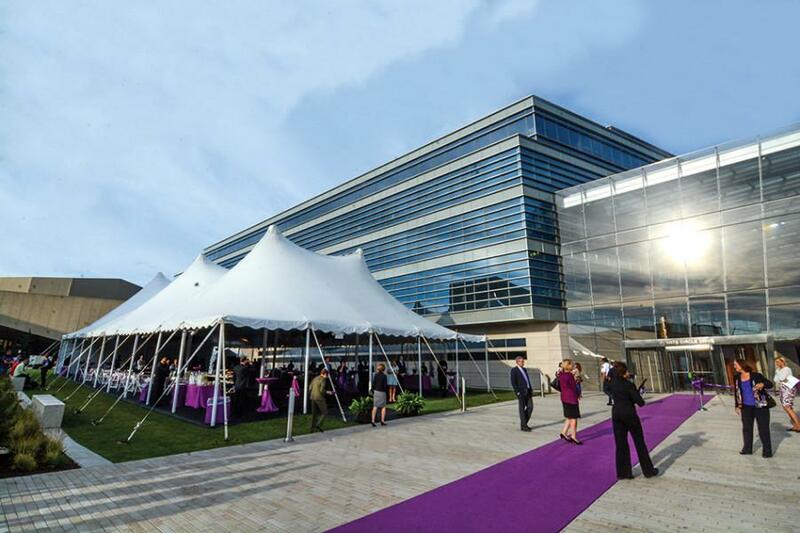 The building, shared by the Bienen School of Music and the School of Communication, was dedicated to the Ryan family in recognition of their support of the arts at Northwestern. Hundreds attended the dedication of the new Patrick G. and Shirley W. Ryan Center for the Musical Arts on Thursday evening with speeches commemorating the Ryan family’s impact on the University. Plans to renovate and expand Bienen — as well as performance spaces belonging to the School of Communication — have been stalled for years, said Bienen Dean Toni-Marie Montgomery. National economic downturns, namely the Great Depression and the 2008 Great Recession, forced NU to set these plans aside despite the poor condition of the music buildings, she said. Former NU President Henry Bienen, who spoke with his wife at the dedication event, described touring the Music Administration Building at 711 Elgin Road with Montgomery in 2003 as she sought to convince him of the need for new facilities. “Inside, it was a disaster,” Bienen said. Recognizing the need for a new building, he ordered a feasibility plan to be completed, and the new building plan was announced in 2008. The Music Administration Building, which was built in 1874, closed last spring. The Ryan Center for the Musical Arts is the latest addition to the campus’ Arts Circle, which includes venues such as Block Museum of Art and The Virginia Wadsworth Wirtz Center for the Performing Arts. Montgomery said one of the requirements set by the University was the creation of a “village-like setting for collegial encounters,” not only among the Bienen and Communication students and faculty who share the building, but also the campus as a whole. Communication Dean Barbara O’Keefe said the new building’s impact is already evident in how it has facilitated what she called a Communication “renaissance” at NU, including the hiring of new faculty and the creation of new programming. The consolidation of administrative offices in the new Ryan Center has opened spaces for students in the Wirtz Center and in the Frances Searle Building that will allow for on-screen acting classes and a new interdisciplinary sound arts and sciences program, she said. The cross-collaboration encouraged by the new building and other improvements to the Arts Circle reflects the interdisciplinary educations the Ryans valued at NU, they said. Patrick Ryan (Kellogg ’59) said since their first gift to the University 60 years ago in honor of their parents, he and his wife Shirley Ryan (Weinberg ’61) have enjoyed their role as supporters of the school. University President Morton Schapiro said the new Ryan Center sits in an important location as the outward face of campus because it sits on the Lakefill, looking toward Chicago.